Many thanks to Paul Doleman for sending me this excellent photograph featuring the Lower Lighthouse. We’ve seen photos of the lower lighthouse before but personally this is the best ones I’ve come across as most depict a view from the other angle, facing to Meols rather than Kings Gap. This older photo published last year was taken from the beach. 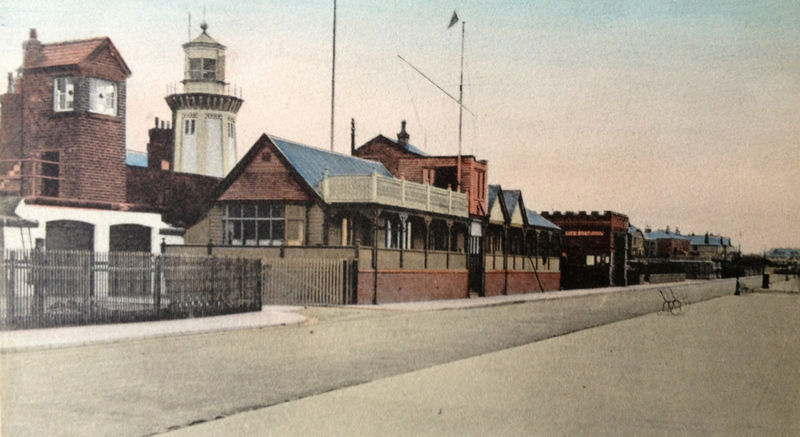 Obviously to the right of the photo is the original Hoylake Lifeboat Station, but what were the other buildings (I know the Winter Gardens cinema was behind the Station)? Is the Keepers cottage out of view (apart from the chimney pots) behind the lighthouse? I’m not 100% sure but I think this lighthouse was deactivated in 1908 and was demolished in 1922. Originally a wooden structure, the Lower Lighthouse was rebuilt in brick, twice over a period of years I gather. I’m not sure but the tall chimneys on two buildings towards the right of the picture might be of the large house and its outbuildings known as Grebnul. Promenade/Marine rd. There’s been a thread before about that area. Will be interested in other peoples take on this. As you say its a very good photo and taken from a clever angle. The single chimney in the middle of the picture belongs to a look-out station which used to be in the corner of the lighthouse / Winter Gardens car park. I was told it was also once used as a radio station in about 1910 by some young men using a spark-gap transmitter. It was disused all my life time and gradually disappeared through a combination of dilapidation, vandalism and deliberate demolition. By the early 1970s it was just a couple of feet high. The chimneys just to the left of the lighthouse may belong to the coastguard houses which adjoined it, but I’m not entirely convinced. I think Grebnul was too far away for its chimneys to feature the way the ones in the photo do. Charles is right – Grebnul was at the far end, corner Kings Gap. The lovely little ‘castle’ – apparently a potting-shed or summerhouse – is still there as are the entrance gate turrets and the castellated wall – what it would be like to have that sort of money to spend on a boundary wall today……..! Excellent photo by the way! Grebnul and the stables were at the foot of Alderley Road on the site opposite the cinema, Jim. The house at the bottom of The King’s Gap was called ‘The Gap’ and belonged latterly to a Prof Charles Wells. Local property developer, John Bradshaw, destroyed this lovely house and bulldozed the extensive grounds in the mid 70s and eventually it was replaced with the hotch potch development known as King’s Court. It was one of Hoylake’s oldest houses and a great loss. My mother rang the council to report that Bradshaw (contrary to the planning conditions) started demolishing the castellated building on the corner and it was then rebuilt. Yes I remember Grebnul, I delivered newspapers there when I was 14. People were employed there to make sails and masts I think. Apparently the name Grebnul comes from Lunberg spelt backwards – a German family lived there during the war and gave it the name. I think those were the facts. Did you live in Lake Place and were your father and brother both named Harold ? An old story about Prof. Wells comes to mind. I remember, when I was in the cubs, Hilbre troop, knocking on the Prof’s door during “Bob-a-Job” week, (Do the scouts still do that?) to see if he had any odd jobs for me to do. I was only about 10 years old, and he showed me round to the side of the house, to the biggest pile of manure I had ever seen outside of Smith’s farm. He gave me a shovel and a wheelbarrow with a wonky wheel and showed me where he wanted it all moved to. That was a very large garden, and I had to shift it to the far side. It took me all of Saturday and into Sunday morning to do it. I was exhausted by the time I finished, despite being supplied with generous amounts of lemon squash and biscuits. He rewarded me with whole shilling for my efforts.